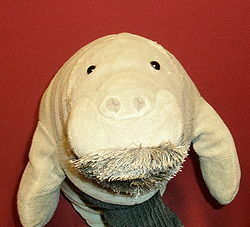 The original Hugh T. Manatee, a regular member of the Funday PawPet Show cast, is up for auction. Funds will be used to purchase new equipment for Poinkcast, HughTube and video archive digitization. Update: The auction raised $102.50, just 43% of the winning bid for Poink T. Ferret in June 2007. A few weeks ago, I started thinking, I'd love to have a YouTube channel focusing on stuff I've done and Hugh and Poink; [...] So, I created HughTube. [...] I decided I really wanted to build this up, film stuff with Poink and Hugh that hasn't been seen anywhere, and really build up the PoinkCast brand. I put together a list of stuff I'd need, and realized that if I did it all out of pocket it was going to take a while. So I posted it on FA and asked for donations. I also realized that the original Hugh puppet is getting very worn; he's been outfitted with propellers, a Green Lantern outfit, buggy eyes, tattoos, etc. And I tend to be very physical when I puppet, etc. And if I'm going to do interviews and such with him, such as say, let him go into a Taco Bell and order a Chalupa, I'd like him to look his best. So a fan sent me a new Hughbert puppet, and other then just looking new, he's spot on for Hugh. And I had promised to sell the old one. So you now have a chance to own an original piece of Pawpet History, AND help out both the PoinkCast, HughTube, and one other special project.